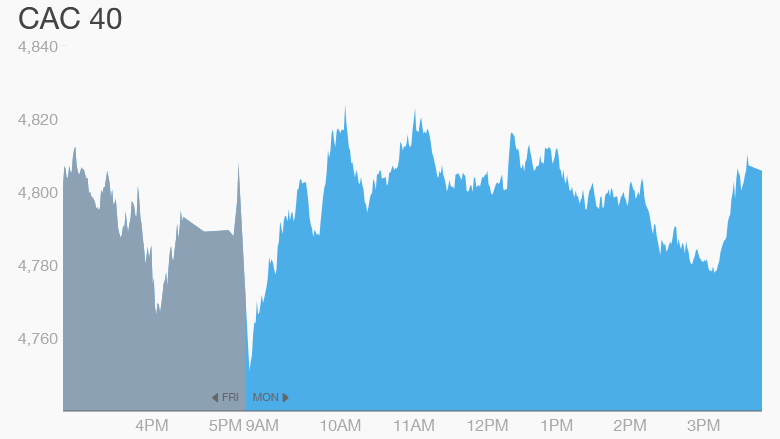 As France continues to mourn after Friday's deadly terror attacks, the country's stock markets showed resilience Monday despite an early fall. Travel and tourism companies were hard hit in early dealing, but initial losses across the market were relatively modest -- the CAC 40 index opened about 1% weaker, and quickly recovered to trade narrowly positive by late afternoon. Other European markets followed a similar pattern. French stocks trading in the benchmark Paris CAC were up 12.5% so far this year when markets closed on Friday. That was just hours before the attacks, in which 129 people were killed and 352 wounded. It was the worst violence France has experienced since World War II. 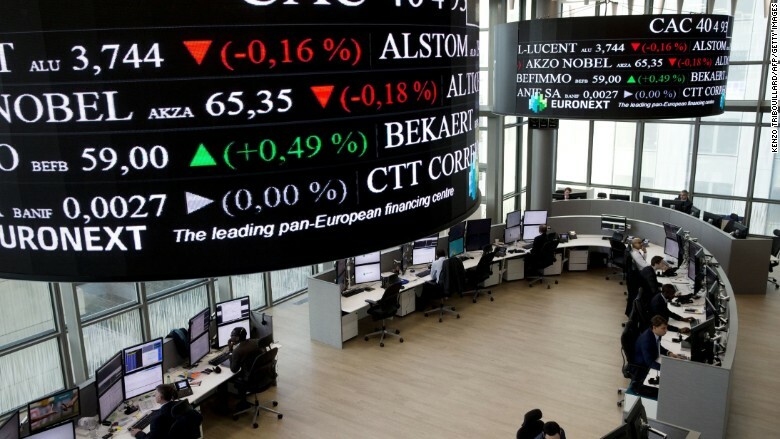 Some of the biggest French companies trade on the Euronext Paris exchange, including KLM-Air France (AFLYY), LVMH (LVMUY), AXA (AXAHY), BNP Paribas (BNPQY), Societe Generale (SCGLY), L'Oreal (LRLCF), Carrefour (CRERF), and Total. Analysts warned the French economy might suffer, at least in the short term, after the attacks. "The truly awful events in Paris could certainly have a significant negative impact on consumer confidence in the near term at least -- obviously primarily in France but also elsewhere in Europe," said Howard Archer, the chief European economist at IHS. The French economy grew just 0.3% in the third quarter, after stagnating in the second quarter. Tourism, a major source of revenue for Paris, could also suffer in the wake of the attacks. Paris is the world's third most popular city for tourists. Shares in French hotel group Accor (ACCYY) and airline KLM-Air France (AFLYY) fell by more than 5%. Eurotunnel Group, the company that operates the channel tunnel between England and France, was down nearly 5%. Still, the impact on markets and the economy from previous attacks in Madrid (2004) and London (2005) faded quickly, and some experts believe France will bounce back too. "Experience suggests that such acts of terror do not derail economic trends in mature Western economies," wrote Holger Schmieding at Berenberg bank. Markets in the Middle East rebounded Monday after dropping sharply on Sunday. Oil prices fell back towards $40 a barrel on Friday, and are now stable at around $41.